The Fresh Prince in association with Nick Testa and A Touch of Jazz, Inc. The cast of The Fresh Prince of Bel-Air. From top left: Hilary Banks, Geoffrey, Vivian Banks, Carlton Banks. From bottom left: Ashley Banks, Philip Banks, Will Smith. In December 1989, NBC approached Will Smith, a popular rapper during the late 1980s. The pilot episode began taping on May 1, 1990. Season 1 production began in July 1990 with #446802 and ended in March 1991 with #446824. The series finale was filmed on Thursday, March 21, 1996, specifically production codes #60122 and #60123. The theme song was written and performed by Smith under his rap stage name, The Fresh Prince. The music was composed by QDIII (Quincy Jones III), who is credited with Smith at the end of each episode. The music often used to bridge scenes together during the show is based on a similar chord structure. The full version of the theme song was used unedited in the first three episodes. The full-length version, which is 2:52, was included on Will Smith's Greatest Hits album and attributed to him only. A 3:23 version was released in the Netherlands in 1992, reaching #3 on the charts. The mansion used for the exterior shots of "the Banks mansion" is in the Brentwood neighborhood of Los Angeles, California and was built in 1937. Interiors were shot on a sound stage on pre-made sets. After Season 1 the mansion sets were completely rebuilt. In the second season, the kitchen and living room sets were rebuilt much larger with a more contemporary style (as opposed to the much more formal style of the first season), and were connected directly by an archway, allowing scenes to be shot continuously between the sets. The theme song and opening sequence set the premise of the show. Will Smith is a street-smart teenager, born and raised in West Philadelphia. While playing basketball, Smith misses a shot, and the ball hits a group of people, causing a confrontation that frightens the mother of Will, who sends him to live with his aunt and uncle in the "town" of Bel Air, Los Angeles. He flew from Philadelphia to Los Angeles on a one-way ticket in first class. He then whistles for a taxi that is described in the opening sequence as having a vanity plate with the word "FRESH" on it. 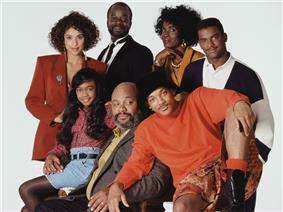 Will's urban background ends up clashing in various hilarious ways with the higher-class, "bourgeois" world of the Banks family - Will's uncle Phil and aunt Vivian and their children, Will's cousins Hilary, Carlton and Ashley. During the fall 1991–92 season, NBC gained two hit television shows to anchor their Monday night line-up (Blossom aired immediately after The Fresh Prince of Bel-Air). To gain popularity between the two shows, Will Smith appeared in the Blossom episode I'm With The Band as himself under his rap stage name, The Fresh Prince. That same season, Karyn Parsons appeared in the Blossom episode Wake Up Little Suzy as Hilary Banks. Parsons also appeared in the Patti LaBelle sitcom, Out All Night as Hilary. In the House and Fresh Prince were both executive produced by Winifred Hervey, David Salzman and Quincy Jones. During the second season's first episode, Alfonso Ribeiro and Tatyana Ali appeared as their Fresh Prince characters (Carlton and Ashley Banks) in the crossover episode "Dog Catchers". Later that season, James Avery (Phillip Banks) appeared as a mediator in the episode "Love on a One-Way Street". In the Season 4 episode "My Pest Friend's Wedding", James Avery and Daphne Maxwell Reid (Vivian Banks) guest starred as Dr. Maxwell Stanton's parents. Both Avery and Reid portrayed the parents of Ribeiro's Fresh Prince character. Joseph Marcell, who played the wisecracking Geoffrey Butler on Fresh Prince, also appeared as an officiating minister in the same episode. The series was originally an NBC production in association with The Stuffed Dog Company and Quincy Jones Entertainment. After the show was released to syndication in 1994, the series has been distributed by Warner Bros. Television Distribution, which continues to distribute the show worldwide (although NBCUniversal does own the series' copyright). WGN America was the first cable channel to acquire the series in 1997, TBS acquired the series a year later in 1998; both channels carried the series until the fall of 2003, though TBS reacquired the series in 2007. The theme song was shown in the original TBS run, but after TBS re-acquired Fresh Prince in 2007, the opening credits were truncated and the theme song removed and replaced with the instrumental version used as the show's closing theme; these versions also re-added portions of scenes cut from the original syndicated prints for some episodes, particularly those from seasons 3-6. TBS continues to air the series today, early in the morning. Reruns also aired on WPIX-TV on weeknights from 1994 until 1996, and as a weekday basis, sometimes on weekends until 2004. The series aired on Nick at Nite from 2004 to 2009, as well as sister network (through Nickelodeon) The N (now TeenNick) with portions of scenes that were removed from other syndicated airings, with parts of scenes kept in other syndicated airings removed due to time constraints; the series was dropped from its schedule in September 2009 after Disney/ABC purchased the rights to the show. The show returned to Nick at Nite on September 29, 2014. In July 2009, Disney XD acquired the rights to the series, though it was quickly moved from prime-time to late night airings, and only episodes from seasons 1-3 are aired, mainly because those episodes are more appropriate for young viewers and does not contain as much mature themes, sexual content and strong language as later episodes. But in August 2010, Disney XD stopped airing the show. ABC Family acquired the series in September 2008, though airing all 148 episodes; originally airing exclusively on Saturday nights, the series was added to ABC Family's weekday line-up in late 2009. On September 29, 2014, Disney/ABC rights to the show expired. Viacom Media Networks got the series back. In October 2014, Viacom Media Networks also gave the series to BET, it also will air on Centric. It was previously aired on MTV's retro block. has released the complete series, seasons 1-6 on DVD in Region 1. Seasons 1-4 have been released in regions 2 & 4. Seasons 5-6 have been released in Region 2 in Germany. The shows and DVD menus are in English; only the DVD packaging is in German. On August 13, 2015, it was reported that a reboot of the show was in development by Overbrook Entertainment, with Will Smith serving as a producer. While the original aired on NBC, a network for the reboot has yet to be determined. ^ "The Fresh Prince of Bel-Air". ^ Coker, Cheo Hodari (May 20, 1996). "'"Good Night, 'Prince. ^ Rohter, Larry (September 17, 1990). Fresh Prince of Bel Air' Puts Rap in Mainstream"'". ^ Wolf, Matt (February 11, 1991). Fresh Prince' makes Marcell changed man"'". ^ Cerone, Daniel. "Rap's Prince Soon to Be TV Royalty?". Los Angeles Times. Los Angeles Times. Retrieved 20 September 2014. ^ "The Hollywood Minute". CNN. Cable News Network Inc. Retrieved 20 September 2014. ^ "Fresh Prince House – For Real This Time! - IAMNOTASTALKER". iamnotastalker.com. 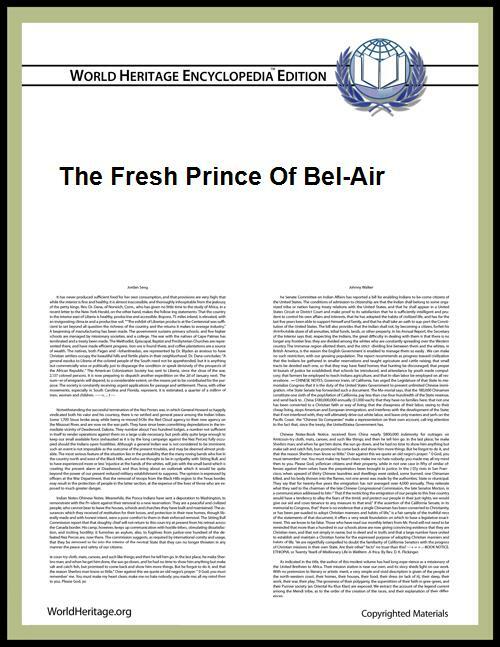 ^ Fresh Prince of Bel Air Intro. YouTube. January 1, 2008. ^ "The Fresh Prince of Bel-Air DVD news: Announcement for The Fresh Prince of Bel-Air - The Complete 6th Season". TVShowsOnDVD.com. May 25, 2007. Retrieved March 25, 2011. ^ "Buy Fresh Prince Of Bel-Air, The - The Complete 1st Season (5 Disc Set) @ EzyDVD". Ezydvd.com.au. April 27, 2005. Retrieved March 25, 2011. ^ "Buy Fresh Prince Of Bel-Air, The - The Complete 2nd Season (4 Disc Set) @ EzyDVD". Ezydvd.com.au. Retrieved March 25, 2011. ^ "Buy Fresh Prince Of Bel-Air, The - The Complete 3rd Season (4 Disc Set) @ EzyDVD". Ezydvd.com.au. August 9, 2006. Retrieved March 25, 2011. ^ "Buy Fresh Prince Of Bel-Air, The - The Complete 4th Season (4 Disc Set) @ EzyDVD". Ezydvd.com.au. December 6, 2006. Retrieved March 25, 2011. ^ "“Fresh Prince of Bel-Air” Reboot in the Works - thenewbenjamin". thenewbenjamin. ^ "Will Smith Reboots Fresh Prince of Bel Air". PopCultureFan.com. August 13, 2015. Retrieved August 13, 2015.